To hear Terry Pegula tell it, the new Buffalo Bills owner was shocked when Doug Marrone decided to leave the franchise on New Year’s Eve. It left the team, which finished 9-7 and was on an upward trajectory, scrambling to find a new head coach. With a varied, ever-changing field of candidates, Buffalo’s future could have ended up in the hands of any number of unpredictable, unproven, or uninspiring options. Instead, they got Rex Ryan. The former Jets coach brings to Pegula and the Bills a proven history of winning and a track record of building one of the league’s best defenses during his six seasons in New Jersey. There’s reason to be concerned about Ryan’s ability to field a competent offense after years of middling results, but overall, this seems like the ideal outcome for Buffalo. If there’d been any doubt about whether Ryan would take a new approach in upstate New York, it was gone within about three seconds. As Ryan stepped up to the mic yesterday, he began his introductory remarks in the way only he can. “Is this thing on?” Ryan asked. “Because it’s getting ready to be on. And that’s the truth.” It sure is. It took just two questions for Ryan to be asked what’s on everyone’s mind: After six years of Mark Sanchez and Geno Smith, there had to be some trepidation about taking over a team without a definite answer at quarterback, right? Ryan offered up a diplomatic response. Both he and general manager Doug Whaley spoke of how quarterback is a spot the Bills have to evaluate, which is a surprise to no one. It’s unclear how Buffalo could turn back to E.J. 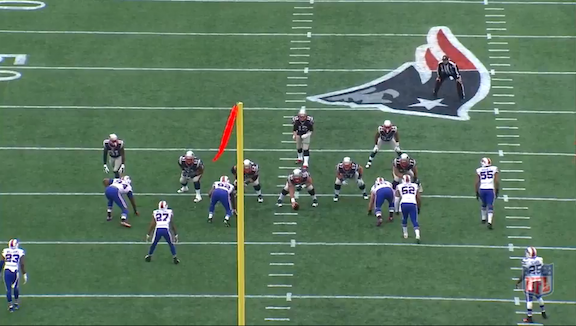 Manuel at this point, so it’s now about where Whaley chooses to look. As Bill Barnwell mentioned on the Grantland NFL Podcast yesterday, Buffalo would be a logical landing place for Jay Cutler if the Bills can pry him away from Chicago for a late-round pick or convince the Bears to help with some of Cutler’s onerous salary. The options elsewhere aren’t very inspiring. Mark Sanchez is a free agent, and despite the endless entertainment value of that idea, it’s probably not the best route to take. Brian Hoyer is another name, but I can’t imagine that the end to his season would have Whaley feeling good about hitching his wagon to the guy who lost his job to Johnny Football. If the Bills do opt to look for a quarterback in the draft, they’ll have to find one without a first-round pick.1 All in all, the entire situation is kind of a mess. On the list of teams that are just a quarterback away from contention, Buffalo might be at the top, which isn’t the ideal place to be as we head into what many consider the most QB-starved offseason in a while. Shortly after Ryan was hired, news broke that former 49ers offensive coordinator Greg Roman would be joining him in Buffalo. On some levels, Roman seems an obvious choice. One way to mitigate the impact of a shaky quarterback is by leaning on the running game, and under Roman, San Francisco was among the most run-heavy teams in football. The Niners ran on 44.9 percent of their plays from 2011 to 2014; only the Texans and Seahawks did so more often, and only Houston got a bigger chunk of its total offense on the ground. Before we peg the Bills as a ground-and-pound offense coupled with a defensive juggernaut — sound familiar? — a few spots need to be addressed. Ryan’s back-to-back trips to the AFC Championship Game came with offenses ranked 11th and fifth in rushing DVOA, thanks mostly to an offensive line that was among the best in the league both years. Roman’s offenses in San Francisco were built the same way, with an offensive line that turned defenses to human dust and allowed the Niners to run all over teams. Buffalo has no such line. The Bills’ group up front is arguably as dire as their quarterback situation. Left tackle Cordy Glenn is Buffalo’s best offensive lineman, but he’s more valuable as a pass protector than he is in the running game. At every other spot on the offensive line, Buffalo can afford to improve. Fifth-round rookie Cyril Richardson showed flashes at guard late in the season, and with another year he could step in next to Glenn and help solidify the left side of the line. Outside of Richardson, though, there aren’t many clear answers on the Buffalo roster. Seantrel Henderson had a few promising moments after being thrust into duty as a seventh-round rookie, but overall, it was a rough year. Erik Pears, whom Henderson beat out for the right tackle job, didn’t fare much better when he shifted to right guard. It’s simple to say the Bills have to throw their resources at the offensive line, but that’s exactly what they did by drafting Cyrus Kouandjio in the second round last year. What they got in return was a player who lost out to a seventh-round pick and played a total of zero snaps as a rookie. Unlike the line, and even with a 33-year-old Fred Jackson and C.J. Spiller’s pending free agency, Buffalo’s collection of skill position players is worth getting excited about. Bryce Brown is talented enough to start for several teams, Robert Woods was solid in his second season, and Sammy Watkins had moments when he looked like the player many assumed he could be before the draft. But as long as the Bills are searching for answers at quarterback and along the offensive line, their offense will remain a problem, no matter who’s calling the plays. Anyone who hates points should be salivating at the idea of Rex Ryan in Buffalo. I honestly feel sorry for whoever’s playing quarterback for the Jets come September. You did nothing to deserve this. It can definitely go that way. During Ryan’s time with the Jets, his finishes in defensive DVOA looked like this: first, fifth, second, ninth, 12th, and 21st in his final season. It’s true that the heights of the Jets defenses during his tenure involved deploying a generational talent at the peak of his career. New York was able to do much of what it did on defense because Darrelle Revis played at an MVP-caliber level during two trips to the AFC Championship Game. 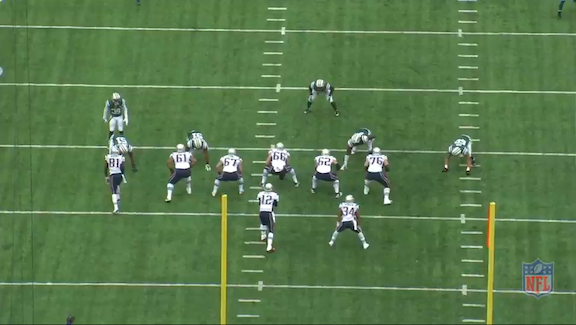 But even without Revis, Ryan put together excellent units with talent that has occasionally been not so excellent. It’s not a stretch to think that, outside of Revis, the group Ryan takes over in Buffalo is better than any he had with New York. Questions about how the Bills will fit into Ryan’s scheme are probably overstated. Buffalo finished second in defensive DVOA this season while playing a 4-3 under Jim Schwartz, but the Bills are also just a season removed from finishing fourth in Mike Pettine’s hybrid alignments. Before Pettine took over as the defensive coordinator in Buffalo, he spent four years in the same position with — you guessed it — Ryan and the Jets. New York’s defense was billed as a 3-4, but, like so many defenses these days, its fronts were constantly changing. Here are two third-down plays against the Patriots this season. Each is from the first quarter, in back-to-back weeks. In terms of the front four, the only difference between the two is Jerry Hughes playing with his hand off the ground for the Bills. Ryan isn’t a stranger to interior players who can get after the quarterback. Just as happened with Sheldon Richardson and Muhammad Wilkerson, Kyle Williams and Marcell Dareus will get plenty of opportunities to attack a single gap and exploit the quickness advantage they have on most guards. The difference between the Bills and just about every roster Ryan had in New York is how much better his edge rushers are. Hughes is a free agent who’s likely to get a nice deal somewhere after notching a total of 19.5 sacks in the past two seasons. 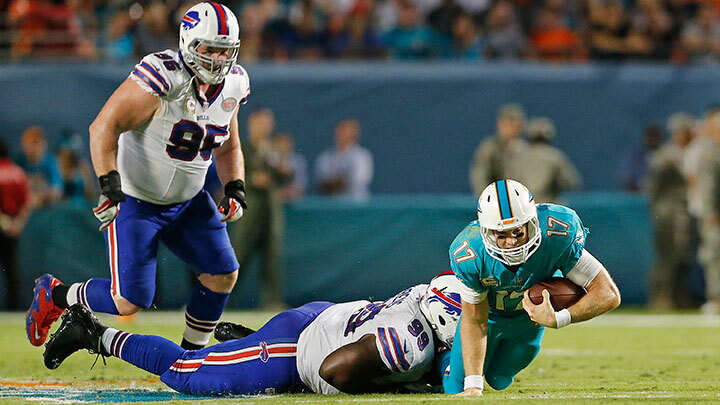 Mario Williams isn’t going anywhere, though. The 2014 version of Williams, with his 14.5 sacks, would be the best edge rusher Ryan’s had since he became a head coach. What made the Bills defense so impressive this year is that it was the best pass-rushing team in football — seventh in pressure rate and first, by a decent margin, in sack rate — despite blitzing less often than all but two teams in the league.2 That strategy doesn’t seem to mesh with Ryan’s reputation as a blitz-happy coach, but the Jets actually toned down how often they sent extra rushers over the past couple seasons. From the start of 2009 through Week 3 of the 2012 season (Revis’s final game as a Jet), Ryan’s defenses blitzed on 42.6 percent of opponent dropbacks, the second-highest rate in the league. From the following week through the end of this season, that number drops to 31.1 percent — 15th in the league. Ryan fully deserves his status as a coach who fits his defense to the skills of his roster. Without Revis, the Jets were, understandably, less inclined to sacrifice players in coverage to bolster their pass rush. The Bills have enough pass-rushing options that it would be a surprise to see them send extra players very often. That’s not to say Buffalo is lacking in the secondary, either. The Bills don’t have a staggering group of talent back there, but after what he dealt with in New York this year, watching Stephon Gilmore and Corey Graham is going to make Ryan feel like he won the lottery. From day one, combining Ryan and this roster should be enough to keep Buffalo at the top of the league, defensively. The offense remains a definite work in progress with more questions than answers. But who am I kidding? We’re still eight months away from seeing what the Bills defense will look like with Ryan in charge, and I already can’t wait. 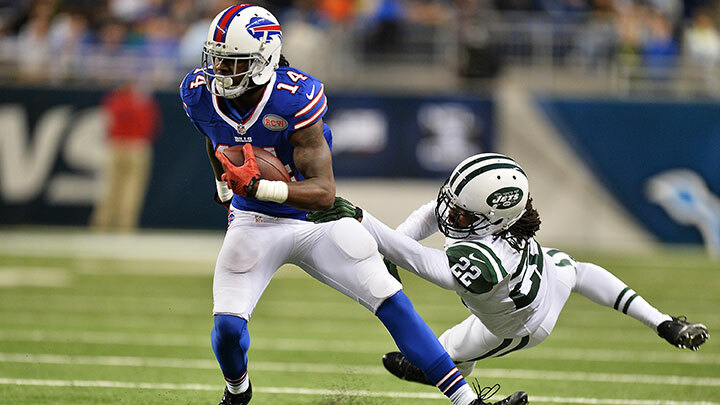 Buffalo traded its 2015 first-rounder to Cleveland in the Sammy Watkins trade. New England and Jacksonville finished 31st and 32nd in blitz percentage.